You can see the problem in the center of the photo. I was using a long reach 1/32” diameter cutter to sharpen the end of the bands on the tank. The band detail was originally cut with a 1/16” diameter cutter. So I was going back with a finer cutter to make the bands sharper. Unfortunately, the long reach 1/32” cutter was much too flexible, so it got off track (it curved to the right on one pass). And then on the next pass, it curved to the left and broke. Grump. The thin part of this cutter is a little more than .4” long so it can reach down to the bottom of the band at the very right. But that long, thin shaft is not stiff enough. I could fix this mold by removing about .010” from the top of the mold and then milling the cavity again. However I also realized I should be user a thicker master. 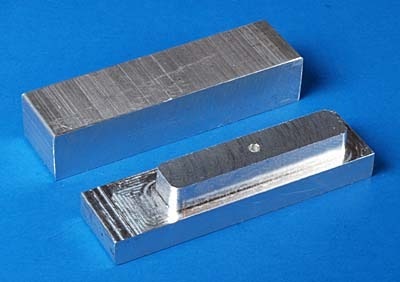 This block of aluminum is 1/2” thick, and the cavity is .04” deep, which doesn’t leave much room on the back to resist injection pressure. So I think I’ll order some 1” thick stock and start over. Some of you are reading this after you’ve already purchased the final kit. I was working on finishing the kit parts up to 9:00 PM the night before my morning flight to St. Louis, so I didn’t have time to take photos and post an update before it was off to National Narrow Gauge Convention. And of course, once there, it was all fun and no time to get on the computer… The kits actually sold better than we expected. In fact, Ragg sold all the kits I made for him at the show, so I’m making more parts. I also neglected to remind Jimmy Booth to make sure he had plenty of 1934 Ford truck kits on hand, so he sold out on the first day, and it would be another two weeks before he would have new kits. Woops. Notice the “flash” around these parts. Once again, the tool path gouged a path for flash into the mold. I noticed this after making one half of the mold, so I was able to eliminate the problem on the second half. But unfortunately, this means I have the “flash” on the parts. Darn! Fortunately, now I know to look for this issue, which I believe is a bug in the program I’m using, and I now know how to get around it. Even better, Jimmy Booth gave me a suggestion on how to fix my existing molds, which I’m going to try soon. The handles are much finer than before (because I got rid of the “flash” problem on this mold). And because the holes are larger, it’s much easier to glue the handles in place. I’m pretty happy with how these turned out. By the way, this is blown up way above actual size, so you can see the tool marks. 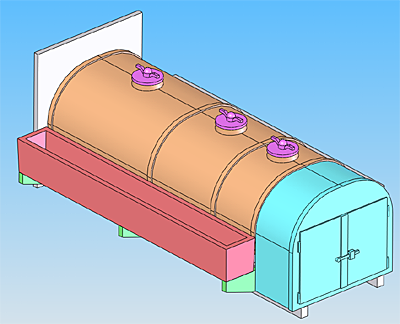 Unfortunately, between making these new molds and making a set of parts, I ran out of time to make a separate mold for the bottom of the tank. As a result, the kits have two tops. You can easily shave off the tank openings for the bottom half if it bothers you. However, you would only be able to see that they’re there if you turn the finished model upside down. 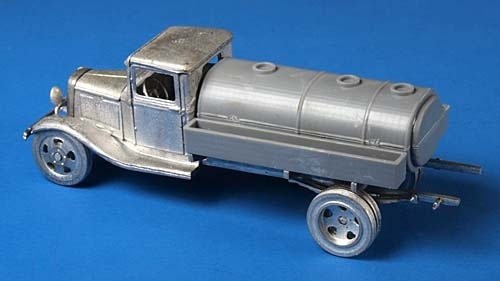 With the strong sales at the show, and quite a few requests, I’ve decided to make an O-scale version that will fit the Berkshire Valley 1934 Truck kit. This kit is the O-scale version of the PBL kit, which were both part of the Wheel Works line of kits in the yellow boxes. 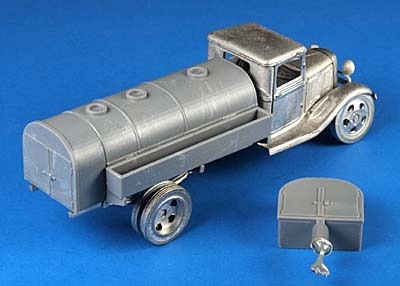 I’d forgotten about one part that Ragg wanted me to make for the tank truck add-on kit—namely, 5-gallon oil cans. I had no idea what they looked like back in the 1920s, so I did a quick search on the internet and found a Conoco 5-gallon oil can from the late 1920s (as you can see to the right). Perfect! Next I added a slightly larger diameter circle on the bottom and extruded it up (middle picture above). Finally, I added some fillets to make the bottom look more like the can above. 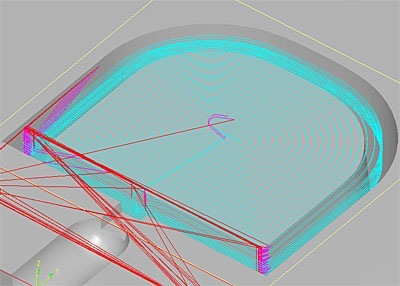 As you can see, building a model in the computer is a series of operations that either add or remove material. Most of the steps so far have been adding material, but the fillet operations knock off the sharp edges, so they’re actually removing some material. The picture in the middle above shows the can after I added some small depressions like the ones on the prototype. These are fairly subtle, so I’m not sure how well they’ll show up on a model that is only about 1/4” tall. Also, the handle that I’ve added is actually solid, as you can see in the right-most picture. But again, since this is only about .01” thick, I’m not sure that will really be noticeable. Ragg suggested that I not include the handle at all, but I wanted to try. The production mold will include some number of oil cans (I’m not sure how many just yet), as well as three sets of lids for the gas tank on the truck. I have some questions about how well these parts are going to turn out, so I’ve decided to make a test mold that includes just one of each part. I’ll probably start making that mold tomorrow, and with any luck will have test parts before the end of the day. We’ll see how the corrugations and the handle turn out. Since my last post, I’ve been mulling over how best to remove the tank end part from the mold. 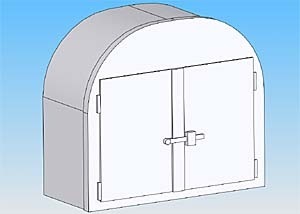 The “right” way is to add ejector pins. 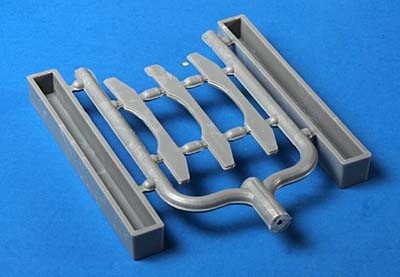 The ejector pins are attached to an ejector plate. 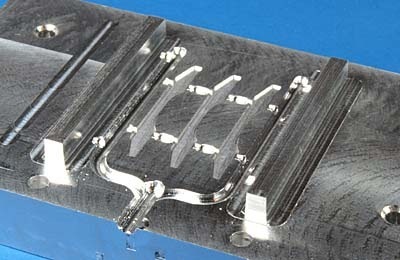 And the ejector plate also has two push-back pins that move the ejector plate away from the mold when the mold halves are closed. I’ve never added ejector pins before, and it seemed like a lot of work. Then an idea struck me last night. Since I’m only making a small number of these, all I really need is the ejector pin and nothing else. I have some 1/4” K&S brass rod that I measured and came out to precisely .250 inches. Plus I have a little bench-top cut-off saw I got from Harbor Freight with a 2” diameter blade. So, first it was back to SolidWorks to add a hole in the middle of the mold, and then back to the milling machine to add this hole. 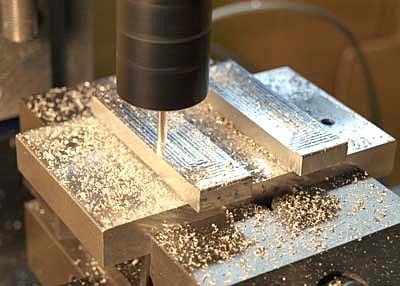 Holes cut by a milling machine or a drill usually aren’t completely smooth, so I use a reamer from and over/under set. These are reamers that are either .001” over or under the target size. Using the over 1/4” reamer makes the hold nice and smooth, and the rod will slide easily, but still with a tight fit so plastic won’t work it’s way between the rod and the hole. Now I only have two more molds to make: the tank bottom, and a mold for the tank covers. Both of these will be straight-forward to make, so I’m getting to the home stretch. While I was waiting for my replacement cutter to arrive, I did some cleaning up in my workshop. I should do this more often because I found some cutters I didn’t realize I had, including another 1/32” long-reach cutter! After quite a few hours, I finally finished milling both halves of the mold. 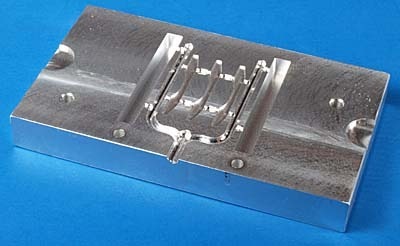 The back side of the part presents some issues in terms of both making a mold and extracting the part from the mold. 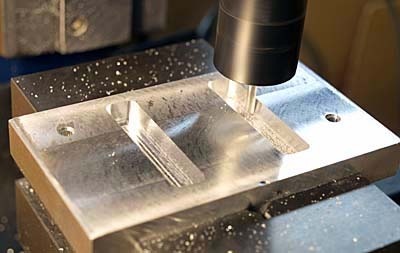 Making the mold requires that I cut some fairly deep slots into the aluminum mold halves. These slots need to about about 1/4” deep, and they’re about .047” wide at the bottom. This particular tool path was for a 1/16” diameter cutter, which I used for the first pass. However, to get all the way to the bottom of the slot, I created another tool path using a long-reach 1/32” diameter cutter. Long reach in this case mean the thin part of the cutter is about .350” long. But that makes the cutter both somewhat fragile, and expensive (about $30 each). I only had one of these long-reach cutters left, having broken a few others while making mold for the top of the tank. So I put my last long-reach cutter in the mill and started cutting. Unfortunately, I was a little impatient, so I set the cutting speeds too high and broke the cutter. Doohh! I’ve ordered some more cutters, and they should be here on Monday, so I’ll be able to continue working on this mold. But the next time, I’m going to cut slower so I don’t break this cutter. By speed, I mean how fast the mill moves while it’s cutting. I had it set to move down at 1 inch per minute, and cut at 3 inches per minute. I thought that was slow enough, but apparently not. The other factor here is that I was using a flat-end cutter for removing most of the material, but I think a ball-nose cutter would be a better choice. 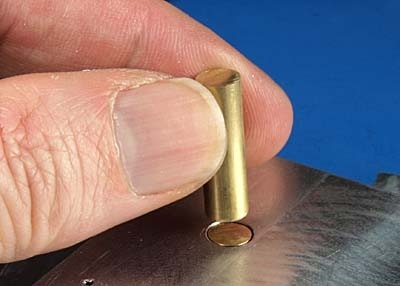 A flat-end cutter experiences some shock when it first touches and bites into the metal. 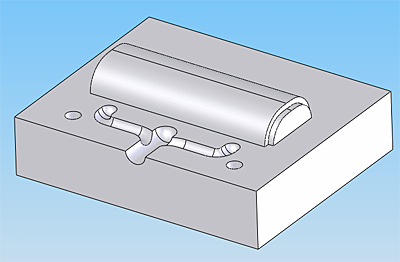 A ball-nose cutter experiences a less sudden shock because the tip is round. I continued working on the core for the tank supports and side troughs. 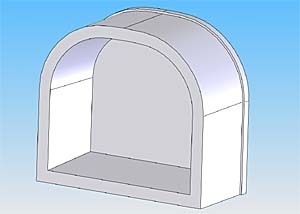 In my previous post, I showed the inserts I was planning on using for the hollow part of the troughs. Here you can see me milling out the pockets for the two inserts. Once finished, I flipped this mold over and milled recessed holes for screws to hold the inserts in place. Then I used a 4-40 tap to tap the holes in the inserts. Or at least, that was the idea—I broke the tap. Darn. So instead I put the inserts into the pocket and then banged on them with a mallet to firmly seat them, hoping I wouldn’t need the screws to hold the inserts in place. The next photo shows me starting the process of milling away the unwanted, extra material from the inserts. This will take about two hours, and then I have to make several other passes with smaller cutters. Not bad, eh? I like it. But I just realized I forgot to make cavities for the tank lids. Woops. At this point I need to create the mold for the end of the truck and the tank lids, and then it will be ready to go.